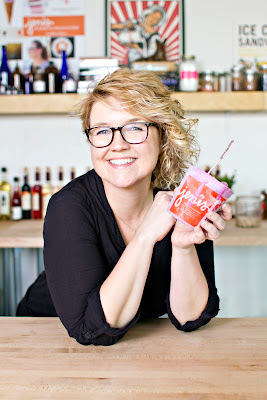 Jeni Britton Bauer is the founder of Jeni’s Splendid Ice Creams and the author of Jeni’s Splendid Ice Creams at Home. I had the opportunity to chat with her during last summer’s Fancy Food Show in Washington, DC. Was ice cream your first life? Or did you start out doing something else? Well, I started my first ice cream business when I was 22 and now I’m going to be 39 this September, so it really is almost my only life. I was in college studying Art and Art History and had been working in a French pastry company since high school. They made everything in their kitchen, and they grew a lot of their own ingredients. It was an all French kitchen, with all French speaking employees. In Columbus! They were actually Belgian. They imported a lot of chefs from France to work there. It was a wonderful experience for a young woman – I was 17 when I first started working there and I just fell in love with France and with the flavors in the kitchen. I was thinking about pastry school when I was in Ohio State as a way to make money doing something creative. But pastry school was way too expensive for me, so I starting making stuff at home. Was I a good student? I was a terrible high school student, absolutely awful. I was a very good student at Ohio State. Ohio State is such a big school, they have everything you could possibly ever want to take, so I only took courses in subjects that I loved. You can even convince professors to let you in even if you haven’t satisfied the prerequisites. All of that served me well in business because I was able to talk to people and customers about a variety of things. So I started making ice cream at home, right after making pastry, thinking to myself, how can I revamp this American thing? Ben and Jerry’s had been in business since 1978, but they really came to power in 1989 throughout the country, so, at the time, Ben and Jerry’s was still a very exciting thing. Did you come before or after Jeremy’s Microbatch? Before. Yeah, Jeremy’s was around for that one year. Your story reminds me of Jeremy’s Microbatch, but with a different third chapter. Oh sure. Well, ice cream is a difficult business. It’s very hard to make a living, very hard pay for everything, hard to go directly to your sources, especially for dairy. It’s really set up for retirees, where you just buy a mix and put it into a machine, like the yogurt business now. I had presumed that your scoop shops make the product on site, but you actually still make it centrally and distribute the ice cream to your shops. The reason why we do this is because we have so much specific machinery. We’re making the marshmallows that go into our ice cream, we’re making the pralines that go into our ice cream, we’re caramelizing sugar in a copper kettle over a fire. So if we had to build this kind of kitchen for every store, it just wouldn’t work. We have very specialized skills – three people in the company can burn the sugar for salted caramel ice cream. That kind of scale doesn’t work to put a kitchen in every store. Where did you come up with the idea, and this is revolutionary, when I first read about it, for including cream cheese and corn starch? I had only ever used the Ben and Jerry’s cookbook and those recipes are custard based, which is the reason why I haven’t made much ice cream. First, you have to stand over the stove and make sure it’s not going to curdle, then you have to cool it down. When I made that batch last week out of the book, the texture was amazing. How did you happen upon that? So, you pasteurize it yourself? Yes! And what I learned, I applied to home equipment. I knew that I could improve on the texture of home ice cream. I had a lot of fun with flavors and I put those in the book, but it’s really about the texture and body of the ice cream, because if you get that right, then you can make any flavor you want, and that’s what I wanted people to take away from the book. You made roasted strawberry, but you can make roasted peach with the same recipe. Whatever you’ve got around you, whatever you’re inspired by, at least you’ll get the perfect texture. Start with great ingredients and know how to treat them, and the book tells you how to do that, and you’ll have great ice cream. What I wanted to be was America’s sweet shop ice cream, scoopable, put it on a cone, lick it off on a hot day. The cream cheese actually was a late addition to the recipe. I didn’t want to do what other ice cream makers did, which was to put out a product which was very different from what they made. When a chef does a cookbook, you know…if I use Thomas Keller’s gazpacho recipe, it’s going to be Thomas Keller’s gazpacho recipe. I might not have a Vitamix, and it may not be perfect, but I’m going to get the same flavor. And if I used a Vitamix, it would pretty much make it such that I could really do it. With ice cream, it’s not the same, with completely different equipment than what you have at home. Most ice cream makers use stabilizers and gums to provide body and texture, and they put out ice cream cookbooks with the same custard recipe that’s in every cookbook, and I didn’t want to do that. I wanted to think about body and texture first, and I wouldn’t have written the the book if I hadn’t gotten that right. I wanted it to be as close to what I actually make in my professional kitchen. It didn’t matter what the ingredients were and what was the equipment used at home, as long as it was home equipment and you could get the ingredients in the grocery store. It’s the same science as what’s used in my kitchen, with ingredients and equipment that are available to the home cook. I’m happy to see that you use the same Cuisinart ice cream maker that I have. I have about 25 of those, and not one of them was free. My recipe has a long shelf life once it’s in the freezer, so you can actually make four or five ice cream flavors for a party. We have kids that are doing ice cream stands instead of lemonade stands, making flavors throughout the week and selling them on Saturday. So you’ve been making ice cream for sixteen years, you’ve written this cookbook detailing the process, so now I get to ask you in person – why four minutes on the boil? Why not five or three? More than four, getting to five and up it starts to become more like a dulce de leche, like a candied milk and you evaporate too much water . Less than that, and it’s icier. You can leave out the cornstarch and cream cheese. The cream cheese adds body, and the cornstarch helps to absorb excess moisture like an insurance policy. The boiling is the most important part of the recipe. The boiling gives it that fine texture, and the cream cheese adds more body, a little more bounce. I like your comment about how it doesn’t make sense to put cut up strawberries into ice cream because they lose their flavor and become chunks of flavorless fruit. It’s part of the science of how you taste things. Something has to be at body temperature before you can taste it…It has to be at the temperature that’s warm enough to volatize to your nose. Any fat that freezes too brittle, like egg yolk fat, takes a lot longer to come to body temperature. Too many egg yolks and you wont’ taste the ice cream as much. Whereas butterfat melts exactly, or actually at two degrees below, body temperature. Which is perfect. When you encapsulate flavor with butterfat, it just relaxes on your palate and goes right into your nose. When you have something that’s icy, it takes lot longer and you’ll just swallow it before it melts and you can taste it. The same holds true for the best chocolate. I don’t know which was the crazier idea: deciding to walk through 32 blocks of traffic and pedestrian-laden New York City streets, or ending that journey by casually strolling into the Hotel Plaza Athenee, sans reservation, for breakfast. To my surprise, the hostess did not bat an eye at my denim-clad, slightly-sweaty form as I requested a table for one. She ushered me into the dining room and tucked me away into a far corner, which gave me a full view of the space. The chandelier lit a high-ceilinged area, yellow with cream accents. Harp music played softly on an overhead sound system. As I was presented with the coffee service, I lifted the urn and found it to be silver and heavy in the way that the carafes at IHOP aren’t. Don’t get me wrong. Usually, when I find myself solo in New York City, I’d be spending breakfast on the run, with a Krispy Kreme doughnut in one hand and a grande Starbucks in the other. But today I was lured to the Plaza Athenee by their new Chinese Breakfast, which offered a broad variety of authentic Asian delicacies curated to appeal to the Eastern palate. Intensely curious, and with no appointment until the afternoon, I decided that a thorough investigation was in order. The first offering was a bowl of congee, which I had always referred to as jook when I was growing up. Served with a side of chopped scallion, the presentation could not have been more elegant. Yet, as is the case with most comfort food from childhood, I found the congee to have missed the mark. As a preparation, it was textbook – grains of white rice, cooked until they’ve collapsed into a soft, smooth porridge. The texture was spot-on. Unfortunately, there was little flavor to be found, even after garnishing with scallion. 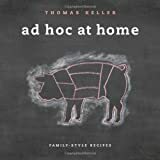 In my household, there would always be bits of salted pork or chicken mixed throughout, adding both flavor as well as a certain level of luxurious fat to the dish. It occurred to me later that maybe it was my responsibility to season the dish, much like when you order grits in the South, but there was little indication that this was the case. Thankfully, the meal improved from there. 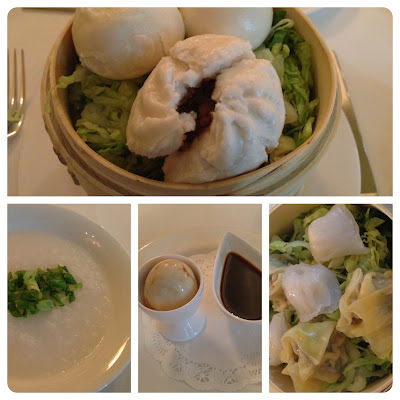 The second course consisted of a two-tiered bamboo steamer, with three steamed buns (bao) on the upper level and a variety of dim sum underneath. Each bun held a different filling, and I was pleasantly surprised to bite into the first to discover a sweet egg custard inside. I’ve never had it before, and it was one of the best things that I’ve ever tasted. From there, I proceeded to finish off the shredded pork bun (a classic filling that was well-executed) and the bean paste bun (never my first preference, but still fairly good). The dim sum were the standard “safe” options, with three har kow (shrimp) and three shui mai (pork), with nary a chicken foot in sight. Both varieties were excellent, bearing the expected thin dumpling skin surrounding very fresh, perfectly seasoned contents. Along the way, the dining captain delivered a tea-boiled egg alongside a small bowl of soy. The egg looked like an orb of alabaster, with streaks of gray where the tea had soaked through the cracks of the shell. And yet, for all of that presentation, I still found it to be too similar, in both taste and texture, to a standard boiled egg. I took my time finishing the meal, watching the servers and the dining captain cater to the small handful of occupied tables in the room. Each dish may not have looked like a lot of food, but the cumulative effect was quite filling. I asked for the check, expressed some sadness at the lack of a room number to sign it to, and took to the streets of Manhattan to walk off breakfast. *the above photo layout is courtesy of Diptic. Check them out on the App Store! 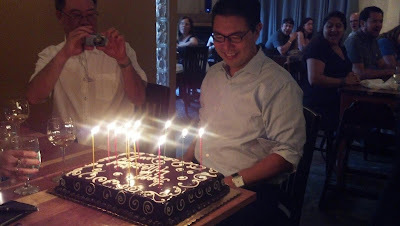 I turned 40 a few weeks ago. In the years leading up to this day, I had grandiose plans in my head for how I was going to spend my 40th birthday. I wanted to start the fourth decade of my life in another country, or on a cruise ship, or in some locale worthy of kicking off a new chapter of my life. But then we became parents. As the calendar rolled over to 2012, I realized that the birth of my daughter almost three years ago was the new chapter, and that the magnitude and joy of this new phase of my life had the effect of making 40 just a number. And in the months leading up to my birthday, I began to realize, to my surprise, that I was going to turn 40 with absolutely no regrets, no remorse, and no wishes for a do-over with respect to anything. And that I would be perfectly fine with a nice, quiet evening at home with my family, or at a good restaurant. Nothing fancy. The truth is, I am happier and more content today than I have ever been, in every area of my life. Having said all of that, I was really quite okay just letting my 40th birthday just quietly roll in and back out like the tide. Maybe a nice dinner out, but nothing extravagant. And since I was treating my 40th as business as usual, I didn’t really have a conflict when Chef John Brandt-Lee of Avalon and Avalon Pasta Bistro messaged me on Twitter, inviting me to a preview tasting of his new Fall menu. The guest list was limited to local food bloggers and journalists, and, given that there was no whirlwind tour of Greece that needed rescheduling, I accepted. It would be, as I had wanted, a nice dinner out, and we’ve loved John’s food ever since we first set foot in one of his restaurants. We booked a babysitter, grabbed a bottle of wine, and headed out to dinner. When we arrived at Avalon, the dining room was dark and empty, since it was 5:30 and dinner service had not started. The tasting was being held in the courtyard in the back of the property, and as the host led us through the restaurant, I greeted Chef John in the kitchen. He held onto my handshake and pulled me closer. “Don’t mention anything about her being your wife,” John whispered, nodding toward Jennifer, “cause no one else back there brought their spouses.” I acknowledged his warning and followed my wife Jennifer into the courtyard. To say that I never saw it coming would be the grossest of understatements. My wife had not only booked the entire restaurant for the evening, but she managed to fill it with family and friends from every chapter of my life. Work friends, college friends, neighbors, and even my best friend from high school, whom I had not seen in almost 20 years. Jennifer had been planning the party for months, even working with Chef John to create a reason for me to abandon our prior arrangements in favor of a “Fall Menu Tasting” – an event that never existed. She had managed to pull off the greatest trick of all time – making me think that going to my 40th birthday party was my own genius idea. And you know what? It was the best 40th birthday party that I could ever have imagined, I had nothing to do with it, and all I had to do was show up! Making extruded pasta at home continues to be a failure. I’ve tried no fewer than four pasta dough recipes ever since getting the KitchenAid attachment, and each time the pasta ends up having the texture of spaetzle – thick, gummy, and bland. What was surprising was that one of the pasta recipes was the same dough that I used for rolled and cut pasta, which has always turned out fantastic. Hopes were high this week when I found a recipe that uses cake flour, which supposedly would deliver a more delicate result. And yet, whether I’m using semolina, all purpose flour, cake flour, or some combination of all three, the results are still disappointing. I’ve cooked the pasta for short, medium, and long periods of time, with no change in the outcome. Calls for advice to the Twitterverse yielded nothing but cricket chirps, reinforcing my suspicion that Twitter is worth every penny of the subscription fee. There’s a rumor flying around Philadelphia that a big-name chef is going to bring a “large, Italian market” to the area, with the most optimistic of sources thinking that Mario Batali himself is going to open an Eataly in Center City, although that seems unlikely. Having gotten lost in the New York City version of same, I can say that having something like that would signal a tectonic shift in the Philadelphia food scene. Still, even if it turns out to be based on the same concept, with a devotion to the highest quality Italian-sourced pasta, meats, and cheeses, and with on-site dining, I really don’t care who’s behind it, as long as their heart’s in it. I think Craig LaBan may be getting the exclusive next week, or even this weekend. If Marc Vetri is the name behind it, it gets my stamp of approval right out of the gate. In an effort to post content more regularly, I’ve decided to post a weekly summary of food-related happenings. Check back every Friday for a look at some quick hits and links out to noteworthy news items that I’ve come across. Format is ever-evolving, so don’t get used to anything. Last Monday was Labor Day, although the weather wasn’t conducive to doing anything that one normally would associate with the holiday. Confined to the house, watching the rain from scattered showers pelt the deck on and off, I decided to try my hand at making bao, which are steamed buns filled with meat and other fillings, and quite a common nostalgic comfort food if you grew up in a Chinese household. I went with this dough recipe from the Los Angeles Times, but instead of using either of their filling recipes, I used some leftover barbecued pulled pork that I had tossed with some barbecue sauce. The combination worked, and the texture of the dough as I bit into it was exactly as I remembered. Now, my bao journey splits into two sub-quests – first, to experiment with traditional and new fillings, and second, to find an equally good recipe for the baked version. Suggestions are welcome. Hit me up on Twitter at @BestFoodBlogEVR. Congratulations to Craig Laban, the food critic for the Philadelphia Inquirer, on being selected as the winner of the Best Newspaper Restaurant Criticism award by the Association of Food Journalists. I’ve had the pleasure of chatting with Craig on Twitter on a few occasions, and he’s always full of wit and wisdom concerning the PHL. The big diversionary piece this week is a Stanford University study showing that organic produce is no more nutritious than conventional produce. Although the study does mention the higher occurrence of pesticides in conventional produce, while noting that these levels are within allowable limits, the mass media has glommed onto the obvious baiting headline suggesting that organic does not necessarily translate to healthier. Yes, it’s that time of year again. For the second consecutive year, the National Association for the Specialty Foods Trade held its annual convention in Washington DC, and we trekked down to the nation’s capitol to discover what’s new, hot, and happening in the food world. The Fancy Food Show is home to 2,400 exhibitors showcasing 180,000 products spanning every possible facet of gourmet food and beverage, with representation by over 80 countries and regions. After checking in and picking up my badge, the Press Room Manager said to me, “I don’t need to tell you about the show, you’re a veteran.” She’s one of those people that I see once a year, but we recognize each other on sight, if not by name, and she does a good job ensuring that badge pickup runs smoothly and that I start the show in a good mood as a result. Her comment made me pause. Was this really my fourth time at the Fancy Food Show? Had I finally learned how to pace myself properly, to keep from exploding in a mushroom cloud of chocolate, cheese, and olive oil? After miles and miles logged on the carpeted floor of exhibit halls in New York and Washington, had I reached a point where I could speak of the experience with authority? Maybe I have. And maybe I should. In the past, I’ve always written about the Fancy Food Show from the perspective of an attendee, but I’ve come to realize that many exhibitors, especially those who’ve never been to the Fancy Food Show, can be just as overwhelmed by the experience, if not more so. Sure, you can get your booth set up, fan some literature out on the table, and offer samples to the throngs of conventioneers – but it can be so much more than that. One: Build Relationships. All Year Long. Every year, about a week before the Fancy Food Show, my inbox gets bombarded with offers to meet and interview the founders, creators, and corporate representatives of exhibitors at the show. It’s all so flattering! And overwhelming! And…entirely ineffective! Here’s why. It’s too much information to process. Most of these emails, even from companies whose products truly interest me, go unanswered, because they’re in competition both with each other as well as with all of my regular, non-Fancy Food Show email. To break through all of that noise and reach me, we need to cultivate a relationship prior to the show. It can be a quick back-and-forth on Twitter, or an email exchange, something that reveals that a producer has at least read a little bit of my writing and has a hunch that their product is a good fit with the site. The interviews that I’m featuring from the show floor this year were pretty much ad hoc, not staged or formally arranged prior to the show. In each of these cases, the companies distinguished themselves as being outstanding in their field, and tasting their product made me want to learn more about the people and the stories behind the process. Most of the exhibitors were really into showing off their products, and would readily engage anyone who came up to their table for a sample or some literature. But with 2,400 exhibitors spread out over two floors of the convention center, attendees have an extremely limited window of opportunity to interact with companies. If your booth was manned by just one person, sitting in a folding chair and checking email on their phone, chances are very good that I didn’t stop. No big deal, because I’m only me, but that probably holds true for any number of major distributors and retailers looking for the next hot thing to stock the shelves. The lesson to be learned is this – send your best, most knowledgeable, and most enthusiastic people to represent your company, without exception. Grill them on your product, if you have to. Role play in the weeks leading up to the show. Emphasize the importance of the fact that the Fancy Food Show is not about babysitting the booth and refilling samples, it’s about winning the game of distinguishing your goods out of a field of thousands. It’s not easy. This is probably the hardest goal to meet. For one thing, you’re in a massive convention center filled to the rafters with thousands of outstanding products. But, from my point of view as an attendee, I can tell you that it will be a long time before I’ll be able to try another Sea Salt Caramel anything. It’s easier to stand out if you’re one of the first producers of an innovative product (black garlic comes to mind), but as breakout product transforms into trend and then becomes almost mainstream (like sea salt and caramel), it just gets harder and harder. So, how did producers grab my attention this year? By having great stories behind the products, and inspiring people who were driven to succeed despite initial setbacks. Or people who just got lucky with an amazing recipe. As an attendee, I’ve already talked about having a narrow window of opportunity to experience as much of the Fancy Food Show as my legs will permit over a two to three day period. So, imagine my consternation, when I’m trying to get from one end of an aisle to the other, and my path is blocked by a giant, wildly gesticulating waffle. It’s one thing if your company has a huge pavilion, and you’ve got some elbow room to offer once-in-a-lifetime photo opportunities with your WafflePerson. But if you’ve got a 10 foot square booth, and your mascot is standing in the middle of the aisle, I’m not going to remember your product. I’m just going to remember the annoying Waffle. According to Google Maps, the journey from my office to the front step of the Revel Resort in Atlantic City is a relatively short 1 hour and 34 minute trip. An invitation to join the Taste of Revel event, paired with the opportunity to cut out a little early from work last Friday, seemed destined to create the perfect gateway to the weekend. Two hours after leaving work, I had only just crossed the Walt Whitman Bridge into New Jersey. Having experienced the rare joy of sitting in rush hour traffic both into Philadelphia and out of it, I was looking at arriving at the event exactly as it was scheduled to start, at 7pm. Indeed, I pulled into the parking deck of Atlantic City’s newest casino hotel at exactly the three hour mark, with ten minutes to spare. It took me twenty minutes, however, to find my way through the hotel, pick up my tickets, and find the venue. Worth playing for? Absolutely. 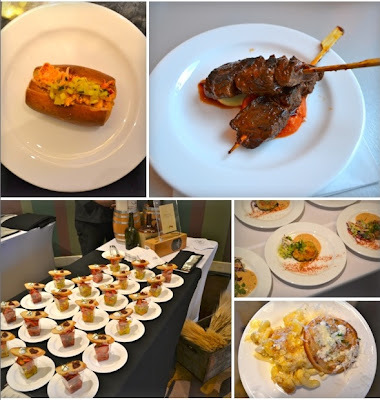 Taste of Revel was billed as a culinary showcase for much of what the new resort had to offer from a talented team of renowned chefs that includes Jose Garces, Marc Forgione, Robert Wiedmaier, Alain Allegretti and Michel Richard. From what I was able to taste on Friday evening, it’s definitely a recipe destined for greatness. Having grown up in New Jersey, I have a fond familiarity with Atlantic City, with memories of looking out at the hotel towers filling the horizon from the backseat of the family car. But as I got older, my initial fascination with the buffets, boardwalk food, and cloned Asian/Italian/Deli/Seafood concepts offered by each casino gave way to a sense of frustrated limitation. Built to appeal to gamblers and no one else, the casinos got away (for decades) with serving overpriced, standard fare to a captive audience that just wanted to cram their maws with food before heading back to the gaming floor. The dining options at Revel are a clear step away from that formula, and a positive sign that the resort is reaching out to a new demographic that may never wager a single dollar at the property, yet drop just as much coin on food and entertainment. I was able to secure a few moments with Nilou Motamed, Features Director and Senior Correspondent for Travel + Leisure magazine, the sponsor, along with its sister publication Food & Wine, of the weekend’s events. Unlike my experience, Motamed had never really been to Atlantic City, so she was seeing Revel’s debut from a completely different perspective. After sharing our surprise at such small details as the availability of Mexican Coke throughout the resort, we talked about Revel’s impact and what this cadre of chef-driven restaurants means for the future of dining on the Boardwalk. Motamed noted that the public’s exposure to chefs as public figures, through reality television and increased food-focused programming in general, has increased the demand for the type of innovative, high-end dining that Revel offers. So what’s good at Revel? I made my way through the crowd, performing quick, surgical strikes to relieve the tables of their burdens, one plate at a time. The Amada crew offered Jose Garces’ take on the traditional “grilled beef on a stick” concept, a spice-forward presentation that was tender, assertive, and the perfect introduction to the new level of dining now available on the Boardwalk. From Azure by Allegretti, a cup of classic bouillabaisse, stacked with snapper, monkfish, shrimp, and mussels in a tomato broth tinged golden with saffron. One, Revel’s American grill restaurant, offered a playful take on a lobster roll, heaped high atop a miniature bun and topped with diced mango and avocado. Standout dishes included a mini crabcake, along with crab mac and cheese accompanied by an onion-bacon tart, both courtesy of Mussel Bar by Robert Wiedmaier. Other passed hors d’oeuvres, of no particular affiliation, brought a lobster corn dog and a small ice cream cone filled with pearls of raw tuna. After the initial kickoff event, I headed to a different part of the resort for a Pastry Party hosted by chef Michel Richard. Richard, a multiple James Beard Award winner, worked the room as attendees noshed on passed plates of eclairs, caramel mousse, and a signature “chocolate bar” – a crisp chocolate truffle base topped with a rich whipped chocolate ganache, dusted with cocoa. As I was about to leave to head home, Michel Richard paused in front of me just as I placed one of his desserts into my mouth. Like a larger-than-life culinary Alfred Hitchcock, he watched me and waited patiently for my reaction. Unable to speak, I gave the chef an enthusiastic thumbs up. A silent nod of agreement from Richard, and we headed our separate ways, both pleased with the results of his efforts. My Twitter coverage of this event can be found at Storify. This the middle of the story. If this looks unfamiliar to you, you may want to start with Part 1. Even though I kept my eyes locked on the entrances to the rail tracks, Dave still managed to sneak up on me. Since he’s not active on Facebook, I hadn’t seen many recent photos of him, and to my surprise, he looked substantially the same as he did in college, although I’m sure the same can be said about myself. We were both older but no worse for wear. Not wanting to waste a moment of catching-up time, we decided to stay in the building while we plotted out our day. We headed downstairs to the dining concourse and talked over coffee for a long time, cramming 13 years of status updates into conversation rife with interrupted thoughts, tangents, recalled memories, and misrememberances. Talking to Dave now, much as I did so many years ago as we sat in Sloppy Louie’s at South Street Seaport, was like starting an old car. You’re afraid that it won’t turn over, but after a few cranks, the engine roars to life, and a few minutes later you’re cruising the neighborhood as if it were yesterday. Before we knew it, a couple of hours had passed, our coffee had turned cold, pastries were reduced to crumbs, and it was time for lunch. Using my phone for research, I started rattling off the names of nearby eating opportunities, but as soon as the word “fondue” left my mouth, our course was set, with Artisanal as our destination. In less than ten minutes, had exited Grand Central Station, walked a few blocks, and were breezing through the front doors. We had the fortune of being seated immediately. Artisanal is one of those restaurants where, if you needed a long, lingering meal as a backdrop to conversation, you’d find it there. We ordered way, way too much, starting with the fondue and augmenting that selection with bread, salads, pork belly hash, and unending cups of coffee. We never ran out of food, and we never ran out of conversation, which is pretty much the perfect combination of unlimited things. Service was invisibly efficient, and I don’t recall ever seeing the bottom of my coffee cup. Eventually, I looked up to see that the restaurant was emptying out, and we found ourselves between the lunch and dinner service. Stuffed, we walked off the meal by heading north, on our way to the second declared destination of the day, Laduree, for macarons. It was a long, necessary meandering, notable for our passage by several locations of former, familiar, landmarks. FAO Schwartz, which has now become a shell of its earlier glory. The Apple Store cube, now standing where there used to be a pit of forgettable dining establishments. We trudged up Central Park East, stopping occasionally to check our phones to get our bearings. Eventually, we hit the right cross street and headed east to Madison Avenue. Laduree was packed, so much so that a line of about 20 people spilled out of the doorway and down the block. There was no sale or special promotion to be had – this was an everyday occurrence. After about 25 minutes, we finally made our way inside and were blown away by the display cases, which were filled with a colorful array of macarons in flavors that ranged from citrus to straight-up chocolate and vanilla varieties. We spent too much, but as in the days of old, we did it in stride. Dave said this somewhere in the vicinity of 70th street, as we ambled up Fifth Avenue, a brisk walk that had its beginnings at 32nd Street and Park Avenue. In actuality, our journey began over 16 years ago, but, due to a combination of factors, had suffered an unfortunate suspension that had lasted for far longer than it should have. His comment made me smile, and, in spite of my aching legs and lingering back pain, I could not have agreed more. All in all, it did feel quite the same. He was the best man at our wedding. But for years before that, when we were in college, he was a great and most excellent friend. We would foray into Manhattan on a regular basis, paying the $1 PATH fare to hop a train from Newark, eating too much, spending too much, staying too late and catching one of the last trains back to campus. Food was always a primary focus on these trips – we would end up at the original Balducci’s on 9th Street, or at Benny’s Burritos. More often than not, we would close out our evenings at an espresso bar in Greenwich Village whose name I’ve long forgotten. To say that I did not see eye-to-eye with Dave’s girlfriend at the time would be a vast understatement. Our personalities, from Day One, just never found any common ground, and when their relationship turned into an engagement, and then into marriage, I had made the decision not to remain as a constant source of irritation and disagreement. Graduation had brought its own elements of separation – Dave went into the working world and I took refuge from a bad economy by enrolling in law school. Time marched on, we lived our separate lives, grew older, and started families – and thus began a 13-year silence and one of the few legitimate regrets that I’ve had in my adult lifetime. With no contact information to be had from Google, and no social networking presence, Dave was impossible to find. Then, in August, from out of nowhere, he sent me a message on Facebook. So much had happened in the span of 13 years. His marriage had ended in divorce, but he was now in the midst of a new relationship with a wonderful woman who was perfect for him – age appropriate, free from a first marriage, and with children of her own. And just a few days after our initial contact, he emailed me to tell me that they were taking a trip to Niagara Falls, where he was going to propose to her. And he did, and she said yes. With so many tales to tell, of his first marriage, his divorce, and his new engagement, along with all of those little details that fill in the gaps in between, there was just no way that it would all fit easily into email messages. So we plotted to return to New York to engage in that old traditional form of communication, walking and talking. And, of course, eating. I caught an early Amtrak out of Wilmington, heading north, while Dave hopped on a Metro North train southbound from Connecticut. I arrived into NYC 45 minutes earlier than he did, and I took the opportunity to grab a coffee and trek uptown on foot, from Penn Station to Grand Central. Even though we were texting back and forth, I still had not actually spoken to him in 13 years. I made my way through the crowds at Grand Central, through the cavernous main concourse, and waited at the staircase, hoping to catch sight of him as he emerged from the platform. A Contest! Chocolate! A Chocolate Contest! I’m not very good at contests, which is why long time readers of this site have never seen me host one. The way I see it, if I announce a giveaway, there are two possible scenarios: either there’s so little participation (or, even worse, none at all) that I’m left picking a winner from a field of two or three readers whom I probably already know, or there’s a flood of entries, and I have to deal with the pressure of picking one deserving entrant with very little guiding criteria. Oh, and then there’s the fulfillment aspect of it all, wherein I drive around for weeks with the prize in the trunk of my car and a To Do List that perennially includes the guilt-inducing task “MAIL PRIZE TO CONTEST WINNER”. Did I mention that The Best Food Blog Ever has no interns? A trip for two of you lovely readers to San Diego, California! And, dinner at The Shores restaurant, which a quick Google reveals to be located right on the beach, offering spectacular views and seasonal dining. Plus, a private wine and chocolate pairing event with Master Chef Michael Antonorsi. And just for clicking and entering, you’ll also be eligible to win one of 14 Limited Edition Sweetheart Boxes filled with 22 bonbons or, as is considered in my household, a single serving. While I will freely disclose that Chuao Chocolatier has sent me review samples of their products for the killer price of zilch, do you know what’s better than getting free chocolate? Winning it. Beating others to it. Outperforming all of your peers to emerge victorious. Blood in the water is one thing. Chocolate brings the game to a whole new level. So, here’s my selfish pitch. This contest is only open to readers of certain food blogs and websites, including this one, so the field of potential winners is much smaller than, say, that of a typical soft drink bottle cap sweepstakes. If the winner of the contest happens to have clicked through the link on this blog to enter, I get a $50 credit to stuff my maw with Chuao product. Plus, another $50 credit to give away to one lucky reader (again, this is good because I don’t have to ship it). So, you get a trip to San Diego, dinner, and a private wine/chocolate tasting. I get more chocolate. And someone else gets more chocolate. And still someone else may get bonbons. I would describe this as a win-win-win situation. All you have to do is click and enter. I believe you can enter as many times as you’d like, once per day, and the contest runs until February 14, 2012. Now go and make me proud with your clickiness.